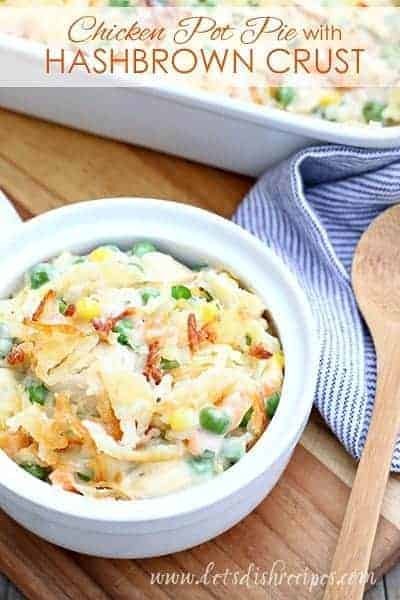 CHEESY CHICKEN POT PIE WITH HASHBROWN CRUST — Hashbrowns replace the usual crust in this twist on classic chicken pot pie! I love a good chicken pot pie, and we’ve tried a lot of variations on the classic pot pie recipe over the years. 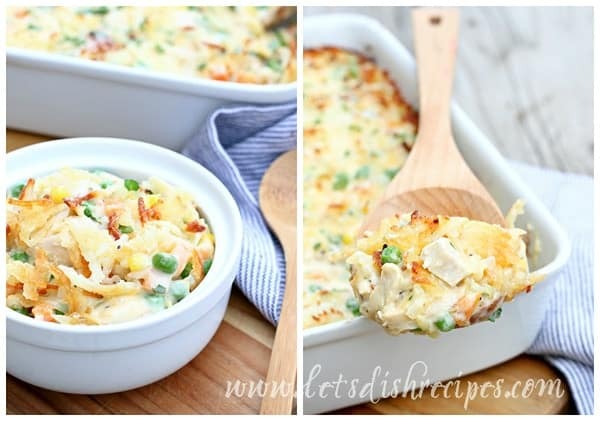 But this Cheesy Chicken Pot Pie with Hashbrown Crust is our new favorite! First of all, what’s not to love about having hashbrowns for dinner? My family would probably eat hashbrowns every day! Especially when they’re nice and crispy on the outside! And since I always include potatoes in traditional chicken pot pie, it only seemed natural to make the crust out of potatoes. This pot pie incorporates two of my favorite comfort foods into one delicious dish! 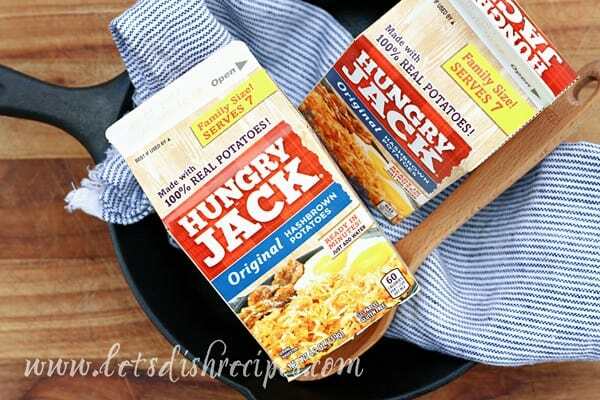 I used Hungry Jack Hashbrowns in this recipe and they were just perfect! I stuck with the original hashbrowns for my pot pie, but they also come in Cheesy and new Black Pepper and Onion flavor too! There are so many things I love about these hashbrowns. First, I can keep them in my pantry. 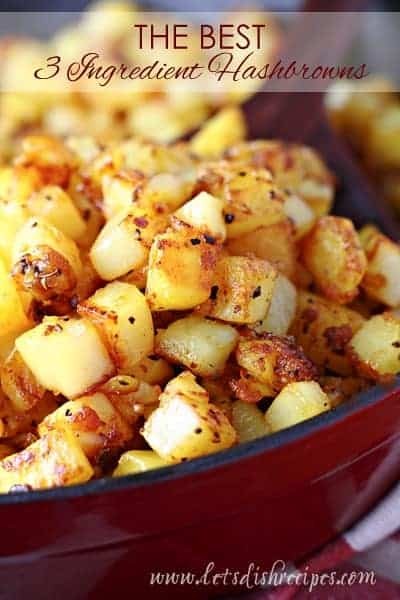 Then when the craving strikes, I just add water and I’m ready to cook up restaurant-style hashbrowns in minutes–no peeling and grating all those potatoes! Who has time for that? I also love that these hashbrowns are kid friendly. Not only can my kids can make them, they love to eat them too! My boys go on lots of camping trips, and they can’t wait to take some Hungry Jack Hashbrowns on their next outdoor excursion. And of course, I love that Hungry Jack Hashbrowns are made with 100% real potatoes. To make my pot pie crust, I re-hydrated a few boxes of Hungry Jack Hashbrowns, then mixed them with melted butter and pressed them into a 9 x 13 inch baking pan. Then I put my crust in the oven to brown for a bit while I made my pot pie filling. Don’t forget to save a few hashbrowns to sprinkle on top! 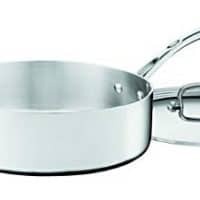 I’ve been making pot pie for years, and have hated that most of them call for canned soup. I’ve used pie crust, biscuits, puff pastry, stuffing…. 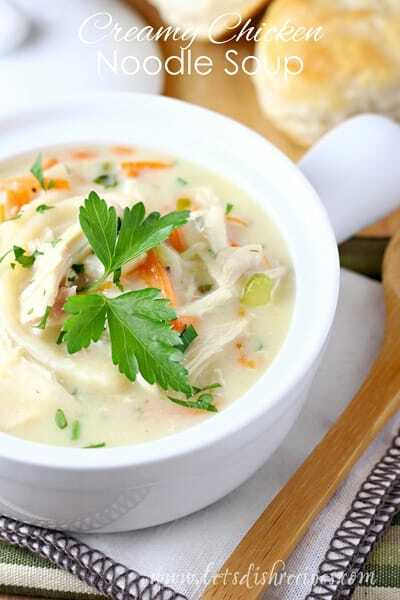 To make this meal super easy, I used a shredded rotisserie chicken and some frozen veggies, but you could definitely cook your own chicken and vegetables ahead of time. My family couldn’t get enough of this unique pot pie creation. 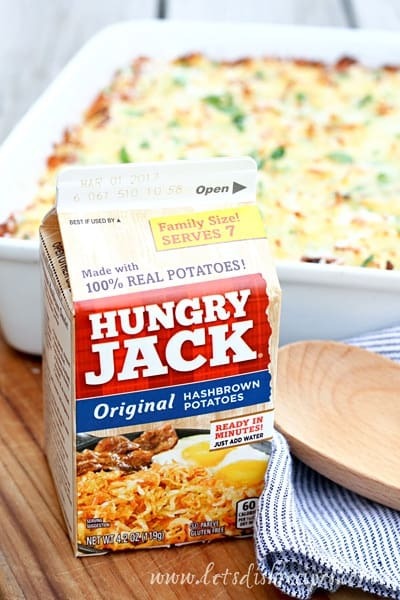 This definitely won’t be the last time we put a spin on our dinnertime favorites with Hungry Jack Hashbrowns! 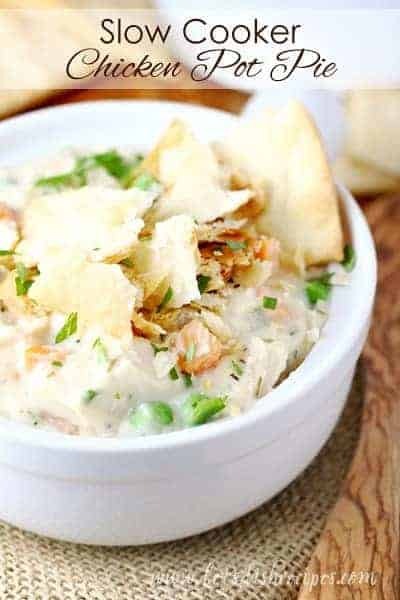 Be sure to save this recipe for Cheesy Chicken Pot Pie with Hashbrown Crust to your favorite Pinterest board for later. 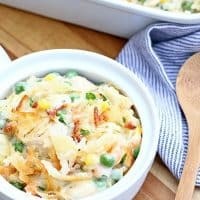 Hashbrowns replace the usual crust in this twist on classic chicken pot pie! Preheat oven to 425 degrees. Hydrate hashbrowns according to package directions. Add re-hydrated hashbrowns to a medium bowl and toss with melted butter. Reserve 1 cup of hashbrowns. Press remaining hashbrowns into the bottom and up the sides of a 9 x13 inch baking dish. Bake for about 15 minutes while you prepare the filling, or until hashbrowns are just becoming golden brown. 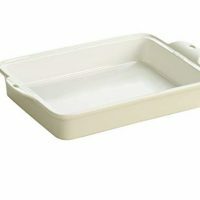 To make the filling, melt butter in a large skillet over medium heat. Add onion and cook until tender, 3-5 minutes. Stir in flour and cook a minute or two more. Whisk chicken broth into skillet, then stir in cream. Continue stirring and bring to a simmer to thicken sauce. Stir in chicken, vegetables, thyme, salt and pepper. Simmer for about 5 minutes, or until vegetables are tender. Stir in 1/2 cup of cheddar cheese. Remove crust from oven. Pour chicken filling over crust. Sprinkle remaining hashbrowns and remaining cheddar cheese over filling. 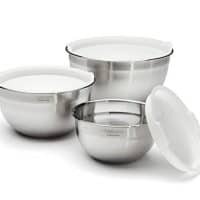 Return to the oven and bake for an additional 20-25 minutes, or until golden brown and bubbling.Before serving, sprinkle with Parmesan cheese and parsley. We really liked them! Especially as regular hashbrowns. Something about the rehydrating (I think that’s what does it)makes them more fluffy on the inside. Whenever I try to make hashbrowns from scratch, they never come out fluffy–more like kind of gooey. So these were great! 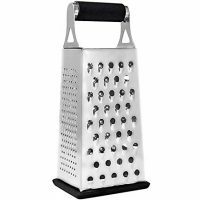 Can you use frozen hash browns? I haven’t tried that, but I think if you browned them a bit first according to the instruction, it would probably work. When do you add in the cup of cheddar cheese? Does this go on top with the reserved hash browns? I’ve been making pot pie for years, and have hated that most of them call for canned soup. I’ve used pie crust, biscuits, puff pastry, stuffing…. Nothing has been nearly as tasty as this recipe! This was delicious! LOVE!! The specific brand of hashbrowns called for in the recipe has to be hydrated. The instructions for that are on the package. Do you think I could make this the night before, refrigerate, and bake in time for dinner? We’re taking supper to some friends who had a baby recently and I’d love to have this piping hot from the oven but won’t have time after work to prepare completely. I think it would work. I’d love to hear how it turns out! I did it last night, and it worked fine! I had to bake an extra 5 minutes or so, but it still turned out great! I had to adapt the recipe to make it gluten free. I used Ore Ida frozen hashbrown potatoes and gluten free flour…super easy to adapt! Thanks for the recipe!! It was very yummy!